It has been raining, seemingly for days, but the little one is napping and I am pulling a warmly scented loaf from the oven. Ahhh, finally nailed it. Our household is officially sick of zucchini bread. The version you will benefit from here is the last of a several week odyssey…chasing a taste memory from childhood. 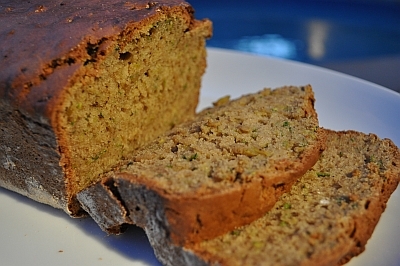 Our neighbor from across the street occasionally would gift us with a loaf of just the best zucchini bread. I began with a recipe I found on the web…great texture but not quite right..it lacked sweetness and spice. I did get my hands on the recipe from childhood(thank you MB! 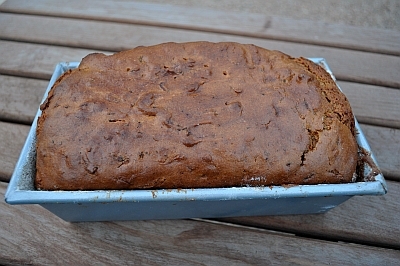 ), but of course that was only the beginning of translation into a gluten free loaf. Multiple batches were necessary in order to achieve the correct level of moistness, spice mixture, texture and oil/flour/sugar/zucchini ratio. A moist loaf with the ability to hold together along with the flavor was an elusive prize. This reincarnation nails the spice, moisture level, and texture. Enjoy! Preheat oven to 350° and grease and flour (or line with parchment paper) two 9×5 bread pans. Or you may use one bunt pan for the entire recipe. In a large bowl whisk eggs together. Add oil and whisk vigorously to emulsify. Add sugar and mix again. Then add vanilla, yogurt, grated zucchini, lemon juice and whisk together. In a separate bowl measure flours, flax, salt, baking powder, baking soda, Xanthan Gum, spices, and nuts. Blend dry ingredients together. Add dry ingredients to the liquid mix gradually and whisk until blended. Divide batter evenly into two bread pans or place all the batter in one bunt pan. Bake one hour at 350 degrees. Turn pans half way through cooking time. Bake until center of loaf reads 190-195° on instant read thermometer or when a toothpick tests clean with slightly moist crumbs.